Athletes Greg Rutherford and Jessica Ennis-Hill are the Sports Journalists’ Association Sportsman and Sportswoman of 2015, sponsored by The National Lottery. Rutherford, who this year added the world championship to his Commonwealth, Olympic and European titles beat two-time Tour de France winner Chris Froome, and triple Formula 1 world champion Lewis Hamilton. Ennis-Hill, world and Olympic heptathlon champion, took the women’s prize for a record-equalling fourth time ahead of cyclist Lizzie Armitstead and skeleton world champion Lizzy Yarnold. The victorious Davis Cup tennis team, led by Andy Murray, was voted the SJA’s Team of the Year after becoming the first Great Britain side to take the title in more than 70 years. The National Lottery plays a unique role in supporting the country’s elite athletes, with 700 Olympic and Paralympic medals having been won since Lottery funding was first awarded to elite athletes in 1997. It has also invested more than £5 billion in grassroots sport. 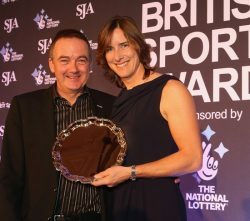 Their Spirit of Sport Award went to Olympic rower Katherine Grainger.